So, the vegan adventure has been going well; I am proud to say that in the three weeks that I have lived in Alberta, I have not bought any animal products from the grocery store, and have cooked all vegan meals at home. There have been a few exceptions, such as meals cooked by Tom’s parents when we visited them in Canmore, or accepting free food from my work (oh yeah, I now work at a bagel shop! I have access to free bagels, soups, cookies, and coffee. I try as hard as I can to make myself vegan lunches there), and overall my food choices are vegan. I think of myself as an opportunivore: if it is a total inconvenience for me to avoid animal products, or if the food is going to be thrown out anyway, I will eat it, but food that I buy myself is vegan. 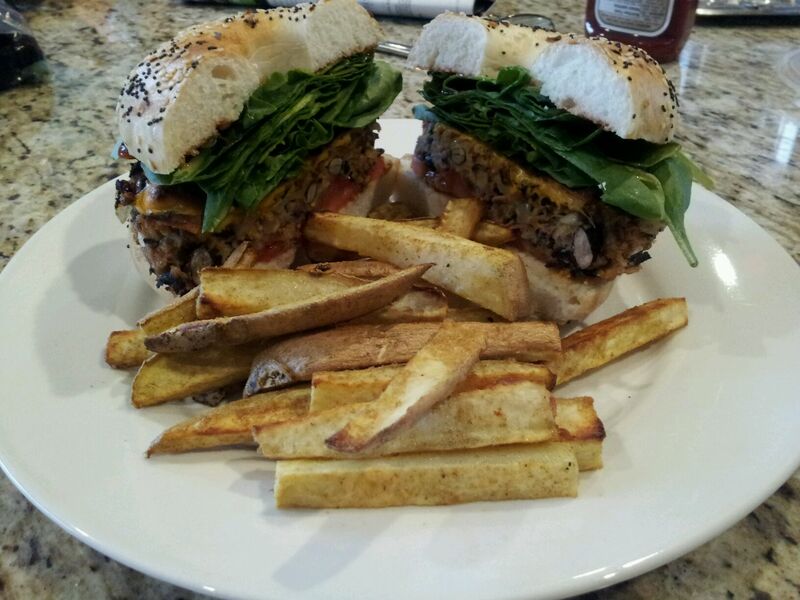 Consequently, I have been discovering a lot of new ways to make my favorite meals, and I could post about every dinner Tom and I have made in Calgary, but I have chosen to report about the bean burgers and the hemp chocolate chip cookies that I made. Another reason for not posting more often this month is that I have been busy climbing in the Rockies. Check out this beautiful view from Echo Canyon, in Canmore, Alberta. After a seventy-minute hike up a steep trail, I got to spend all day with this view. I started by frying up the onion, carrot, and garlic. In a bowl I mashed together the beans (though next time I make these I will grind them in a food processor to break them down even more), then smushed all the other ingredients together in the bowl. I formed the mixture into patties, and fried them in a bit of oil. Presto! I served the burgers on bagels from the bagel shop I work at, and made some yam fries in the oven (tossed with oil, cumin and garlic pepper, then baked at 350 degrees for about 25 minutes). Delish! 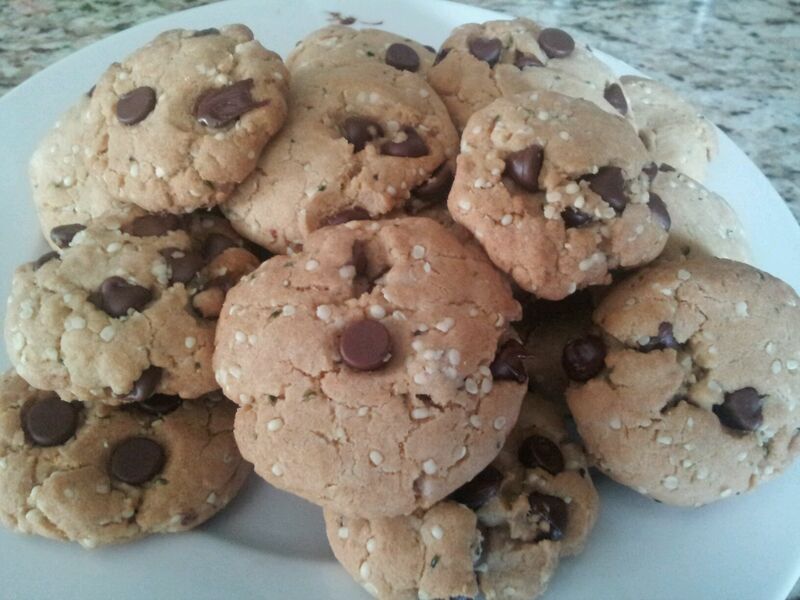 I had the urge to bake something today, and my sweet-tooth was hankering for some chocolate, so I found a recipe for vegan chocolate chip cookies, and added hemp seeds to them. In a bowl I creamed together the oil and the brown sugar, then added the almond milk and vanilla. I added the dry ingredients and mixed until everything was incorporated. Then, I stirred in the hemp seeds and chocolate chips. The mixture was dry, but the recipe said that this was normal. I formed the cookies to be about 1 tbs round, pressed them down a little on the cookie sheet, then baked them at 350 degrees Fahrenheit for about 10 minutes. They turned out really well, and hemp seeds are incredibly good for you! If you’re caught without eggs and butter, I suggest trying these and seeing how possible it is to make cookies without using animal products.